Do you prefer a stool at the bar to a table? Want to save your spot on a restaurant’s patio? 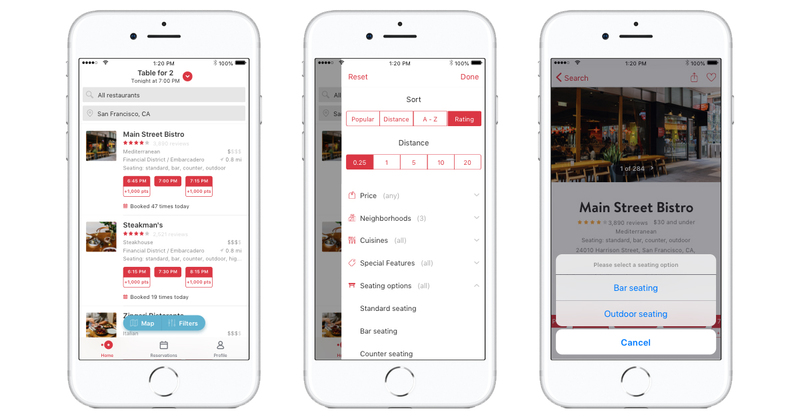 Now you can with the global rollout of Seating Options, a feature that allows diners to reserve a seat at the bar, counter, a table outside, and more during the reservation process. Not only does the feature give diners the freedom to choose where they want to sit at the restaurant, even before they arrive, but it also increases restaurant availability during peak dining times. Let us know your experiences with OpenTable seating options here in the comments or over on Facebook, G+, Instagram, Pinterest, or Twitter. And, remember to snap + share your #dishpics with us on Instagram for a chance to win in our weekly giveaway.